Meibutsu 名物 or famous pieces (名 = famous, renowned 物 = thing, piece) refers to famous tea wares, widely regarded as outstanding pieces by teaists and connoisseurs. Meiki 名器 (名 = famous, renowned 器 = vessel, utensil, equipage) is a term used interchangeably with meibutsu. Meibutsu can also refer to pieces of great provenance, for example, a piece handed down through the ages by an influential family. All in all, there are hundreds of tea wares deemed to be 'meibutsu' across tens of documented meibutsu collections. As tea caddies or 'chaire' were the most prized tea pieces since old times, chaire feature most predominantly in meibutsu compilations. 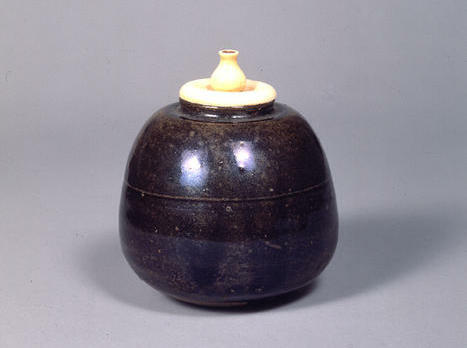 Other tea wares that feature heavily are tea bowls (chawan) and tea jars (chatsubo). A history of compiling artworks into 'meibutsu' catalogues can be seen in China prior to those in Japan. In China there exists the discipline of 'Meibutsu-gaku' or the formal study of meibutsu pieces. In Japan, meibutsu collections for chanoyu started to be recorded as the art formalised in the mid-late Muromachi Period (1336-1573). The actual appraisal of art works and the compilation of meibutsu catalogues was carried out in an authoritarian manner by certain aesthetes of influence. If one looks upon meibutsu catalogues with favourable eyes, one can say they serve to educate practitioners, participants and artists involved in the art of chanoyu about outstanding examples of tea equipage. One can equally view meibutsu catalogues as tools to assert the power and authority of certain families or figures in tea history, often the very individuals compiling the catalogues. Above is an example of an ōmeibutsu chaire - Rikyū's 'shiri-bukura' (fat-bottomed) karamono chaire. This is the chaire mentioned in some of the diagrams of the sumi-biki section of the Nampō Roku. It is used as and example of an 'hitotsu-mono' (meibutsu) piece that requires a prioritised manner of handling in a tea rite. This particular piece appears frequently in records of Rikyū's chanoyu, including the Kitano Grand Tea Gathering (1 Nov. 1587). After Rikyū's death it came into the hands of the Tokugawa before being awarded to Hosokawa Sansai for his role in the Battle of Sekigahara (1600). Shiri-bukura has stayed in the Hosokawa family ever since. Meibutsu pieces are handled in a very specific way during a tea rite to distinguish the meibutsu from the other pieces in use. Educated participants in a tea gathering will know immediately by the way a person handles a chaire, chawan, etc., that the piece is a 'meibutsu'. Even today when the chance of ever usuing an actual meibutsu piece in a tea gathering is close to zero, all practitioners of chanoyu still learn procedures for handling meibutsu as a standard part of their curriculum. The most influential meibutsu collections are the 'ōmeibutsu' catalogues and the 'Chūkō Meibutsu Mokuroku'. Ōmeibutsu 大名物 catalogues are those compiled during or before the time of Sen Rikyū. Ōmeibutsu therefore refers to extremely valuable equipage with great provenance. These pieces are mostly made up of the Higashiyama Gomotsu 東山御物, a collection of tea wares and other art works compiled by 8th Muromachi Shogun, Ashikaga Yoshimasa (1435-1490). The titles of some other well-known and influential ōmeibutsu catalogues are the Shukō Meibutsu 珠光名物 (the exquisite pieces owned by Murata Shukō), and Rikyū Meibutsu 利休名物 (the exquisite pieces owned by Sen Rikyū). Chūkō Meibutsu 中興名物 refers to pieces that were selected as ‘meiki’ by Kobori Enshū after Rikyū's time. The 'Chūkō Meibutsu Mokuroku' was composed by Kobori Enshū (1579-1647), an acute aesthete and founder of the Enshū Ryū school of chanoyu. Other well-known meibutsu catalogues are the Enshū Kurachō 遠州蔵帳 (a compilation of the pieces held by all the Daimyo of the time), Ryūei Gomotsu 柳営御物 (the meibutsu owned by the Tokugawa Shogunate), Senke Meibutsu 千家名物 (meibutsu of the Sen families), Ennan Meibutsu 燕庵名物 (the meibutsu of the Yabunouchi family), Unshū Meibutsu雲州名物 (meibutsu owned by fuedal lord of the Matsuei Domain, Matsudaira Fumai (1751–1818)), and others. Meibutsu were further classified into ‘upper’ (上), ‘middle’ (中) and ‘lower’ (下) ranks, during the Edo Period (1603-1868) when the division of temae into shin (formal 真), gyō (semi-formal 行), sō (informal 草) versions become popular. The upper, middle and lower categorisation of meibutsu accorded well with the shin, gyō and sō levels of the temae. Practitioners of chanoyu these days have virtually no access to meibutsu pieces. Learning intricate handling for pieces one will never get to use seems like a waste of time. One can of course buy 'utsushi' copies of meibutsu pieces, but this whole enterprise is questionable in my opinion as it restricts the life of chanoyu culture. There is no stopping teaists with an eye for beauty deciding on their own pieces of unique value. These 'meibutsu' of one's collection can be brought out for occasions when one wishes to spark a deeper sense of reverence in the tea room. The meibutsu collections of old are there for us to study the classic pieces that pushed the aesthetic buttons of Rikyū and co. With all these pieces buried deep in private collections and museums, we should keep the flame of chanoyu alive and search for our own - there are certainly many artists making new tea wares that achieve new expressions of beauty. And with chanoyu spreading globally, there are sure to be mitate pieces laying in wait to find new life through chanoyu.